"Every American should be proud that we are finally bringing North Carolina pastor Andrew Brunson home. His release today, after a two-year unjust imprisonment, was only possible through millions of prayers and the concerted efforts of President Trump, Vice President Pence, Secretary Pompeo and members of Congress. This needs to be the end point for the many acts of aggression and human rights violations for Turkey and President Erdogan." SEE RELATED: Fox News: "Rep. Walker fights to bring American pastor home from Turkey"
In July, Walker introduced the Turkey International Financial Institutions Act, legislation that would direct U.S. representatives at international financial institutions such as the International Monetary Fund (IMF), World Bank, International Finance Corporation (IFC) and European Bank for Reconstruction and Development (EBRD), to oppose loans to Turkey, pending the release of Brunson, U.S. citizens, and consular staff. In May, Walker was part of a bi-partisan House effort, sending a letter with 153 other Representatives to President Erdogan demanding the release of Brunson. On July 26th, the House passed the Conference Report to Accompany H.R. 5515, the John S. McCain National Defense Authorization Act (NDAA) in a 359-54 vote, which included a provision added by Senator Thom Tillis (R-N.C.) that directs the Secretary of Defense to submit a report to Congress reviewing the Turkish government's participation in the F-35 program. Brunson, the pastor of Izmir Dirilis (Resurrection) Church in Izmir, Turkey, was detained on October 7, 2016 on charges of "support of a terrorist organization" and "political or military espionage." Brunson was transferred on July 25, 2018 from jail to house arrest while awaiting the next hearing on his case. 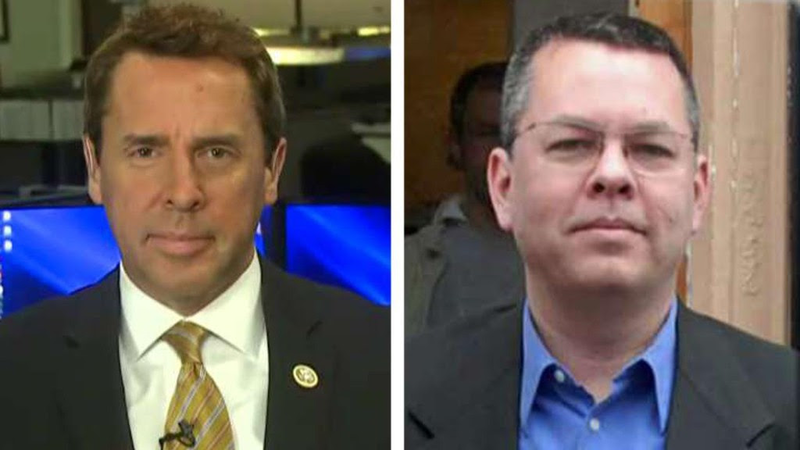 According to the United States Commission on International Religious Freedom (USCIRF), "Pastor Brunson initially was held in a cell with 21 other inmates that was built to hold only eight prisoners. He was transferred in August 2017 to Kiriklar Prison where he was in a cell with two other men who have been accused of being members of the Gülen movement. He spends 24 hours a day in his cell, leaving for one hour weekly for visits. Sometimes he is allowed family visits and the U.S. Embassy sees him regularly." "The case against Pastor Brunson seems to be based on secret evidence and a secret witness," USCIRF adds. "He has been incarcerated since October 2016 without due process and inadequate physical and psychological support."